Acne is one of the most common and widely spread chronic skin disorders affecting millions of people around the globe. The primary cause of acne breakout is rise in the level of androgens. Higher androgen level induces the sebaceous glands to produce more sebum. A lot of methods and medications have been introduced with time which ranges from anti biotic to various herbal and home remedies. 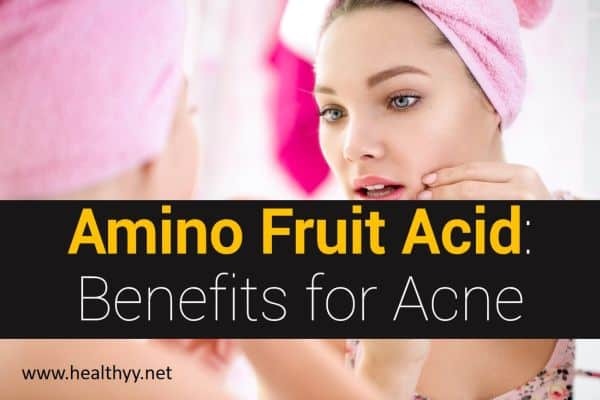 This article tends to discuss the efficacy of Amino Fruit Acid in the treatment of acne breakouts and acne scars when it is used topically as a lotion and also when it is used as a vehicle in the process of chemical peeling. What is Amino Fruit Acid? Amino fruit acid is a kind of alpha hydroxyl acids found in various fruit and vegetable sources. They are derived from a number of natural sources and usually include citric acid, malic acid, and tartaric acid among others. They are often considered beneficial for the skin and are present in a large number of cosmetic products. They tend to rejuvenate the skin and when used in a peel, they have and exfoliation effect which works towards the improvement of the health of the skin. Amino fruit acid has been known to be beneficial in the prevention of both acne breakouts as well as acne scarring. It exhibits exfoliation properties which when applied on the skin tend to remove the dead skin cells by penetrating into the upper layer of the skin. This penetration to remove the damaged and dead skin cells tend to stimulate collagen formation which induced by the immune system starts speeding up the recovery of the skin and forms a new layer that is more firm and tight apart from being damage free and clear. Amino fruit acid can be used for acne prevention in two ways. Firstly, it can be used as a cream or lotion applied topically on the skin which tends to exfoliate the damaged skin. This can be done at home. Secondly, it has largely been used in chemical peels. Amino fruit acid peels are found better in the sense that since it has larger molecules, it does not go extremely deep in the skin. While this does not affect its effectiveness in any which way, it tends to reduce the treatment induced skin irritation which is a common side effect of chemical peels. In this sense, it is better than glycolic acid when it comes to chemical peels. While it is usually recommended for dry and sensitive skin because of its moisturizing properties and reduced impact of side effects, it usually also works well on oily skin. The dosage of this acid depends on the condition and severity of the condition it is treating. Given below are its dosage of topical application for acne and acne scars respectively. For problems like breakouts and wrinkles, a topical solution in the concentration of 8% can be applied twice daily. For acne scars, the method of chemical peels is used in which various concentrations of 20%, 30%, 50%, and 70% are available. However, you must consult a doctor before using higher concentrations. It is usually advised that any such peeling activities be carried out only under the supervision of a registered doctor or dermatologist. While its topical applications during times of pregnancy or while breastfeeding is considered safe, its oral intake is still debatable. To be on the safe side, it is usually advised that you do not use it as such times. Since it makes your skin sensitive to sunlight, it is usually advised that you avoid exposure to the sun and in case it cannot be avoided completely, wear a sunscreen or protective clothing while going out. If your skin is extremely sensitive, consult a doctor before going for a chemical peel. Tell your doctor about all the topical medications as well as cosmetics you have been using on the skin. Amino fruit acid with its exfoliation and moisturizing properties makes the skin smooth, soft and clean. It is known to work even on sensitive skin and the side effects are negligible. If you want to go for chemical peeling this might be the right choice for you. Can Glycolic Acid Peel Help in Acne Treatment?